Last week I started cutting the top skin off the cabin top in preparation for the recore project, but quickly discovered how weak the underlying bottom skin is once the top skin and core are removed. 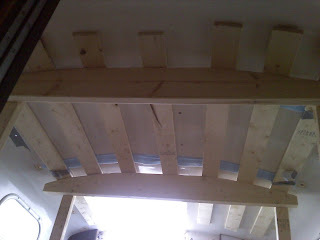 I was concerned that if I removed too much of the deck I would distort the shape of the cabin top and weaken it structurally. I got some good advice on building deck support frames from inside the cabin from a bunch of folks over at http://www.plasticclassicforum.com and decided that I would have to get this in place before I continued removing the core. Unfortunately, the warmish weather earlier this week (35-40) didn't last and an artic cold front moved into the region on Friday. When I woke up Saturday morning, the temp was -8 degrees F. and the predicted high for the day was under 15 degrees F. Not really the kind of weather you want to be working outside in. I loaded up on coffee and spent extra time hovering around the woodstove before I finally got up the courage to get started. 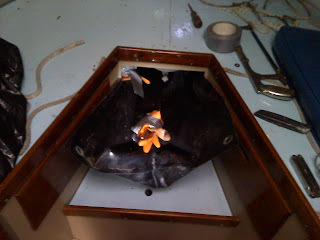 I fired up the salamander heater, but since I was working inside the boat, it didn't seem to do much good. 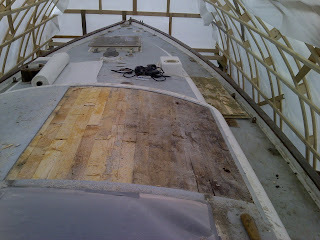 I probably got the shed up close to freezing, but I don't think I got the interior of the boat even close to that... I had to work fast or my fingers would be a mess. 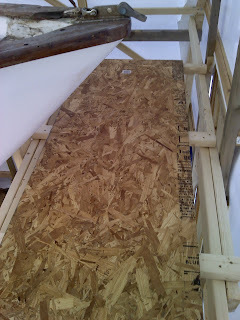 I started off by cutting a few 2x6 boards to about 55" and then dragged my wife out to hold them up so I could scribe the curve of the cabintop onto the boards. I used to use a standard pencil compass to scribe, but have since found that finding any kind of plastic circle that has a diameter greater than the arc you need, with a hole in the center that a pencil will fit snuggly in works best (See picture, here I used an old water bottle top). Once I scribed the lines to the boards I simply cut out the arc from the board with a sabresaw and cleaned it up with a shinto saw rasp (a most excellent tool). 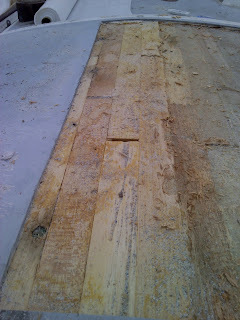 Next I cut a bunch of 1x4s the length of the cabin I need to support and screwed them to the 2x6s. 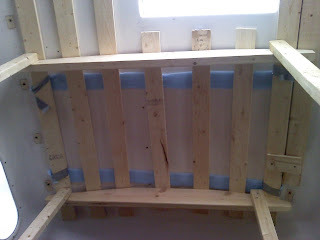 I put a few strips of foam sill gasket on the top of the frame so there wouldn't be any hard spots from the frame on the headliner. To get it in place I cut a 3 2x3s to roughly the height I would need to wedge them in place and then basically balanced the whole thing on my head while I wegded the 2x3s into the corners. Once stable I screwed the 2x3s to the frame and cut a few more to provide more support (See pictures below for a better explanation). By this time I was absolutely frozen and my fingers were quite numb. Thats all for this weekend, next week I will provide a few more supports for the forward cabintop (this area is better supported so it doesn't need to be as elaborate as the main cabin). Then I can go to town ripping the rest of the cabintop off. I am planning picking up a Dremel Multimax this week to help dig out some of the more tenacious core. Not sure who this monkey is, but he sure has a stylin 3M 6900 Full Face Respirator with some sweet pink particulate filters. 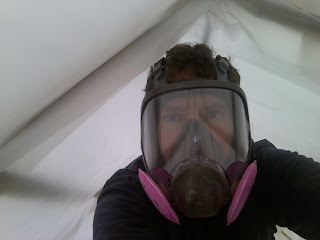 In the past I have done some really stupid things when working around dangerous debris, chemicals, etc... and decided that this time I would invest in a quality respirator, instead of using those cheapo dust masks that really don't do much of anything except remind me how bad my breath is. It worked really well, no fogging problems and the strap system keeps a tight seal with no discomfort. 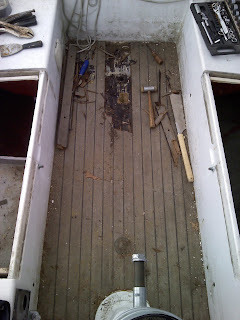 I finally got everything I needed to remove from the boat finished (almost of course) and decided it was time to man-up and set the circular saw loose on the decks. 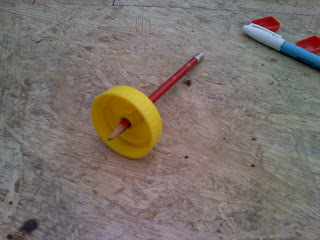 I had considered using the rotozip with a tile cutting bit but had heard mixed reviews so I stuck with the circular saw. I'm not sure how much I will open up at one time before actually recoring with new balsa, but my thoughts right now are to manage it by section. 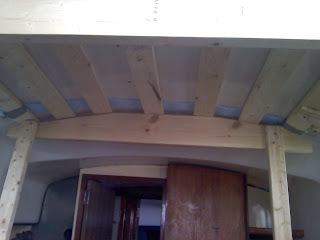 So, start with the cabin top around the companionway, then move forward to the mast step area, and then move onto the side and foredecks. I am pretty pleased with how easy it was to open up (I wish the same could be said in reverse). I was a bit limited because my saw didn't have a full charge in the battery (Note to self: buy another 18v battery), so I really only tackled about 1/3 of the cabin top around the compainionway. 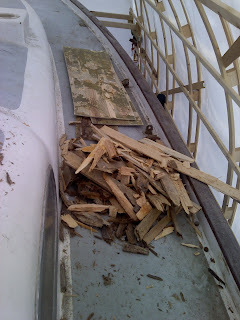 The skins came off with very little struggle, and as expected, a good portion of the balsa was pretty much mush and could be yanked out easily. What I didn't expect was how much of the balsa was still intact and in good shape. Not sure what I should do about it, I hate to yank it if it is still good, but it might be more difficult trying to match them up... I don't know. Here are a few pictures from what I did; note that the balsa that was saturated is much darker in color, the lighter stuff looks brand new and if I decide to rip it out, I think it will be a hard job. boat with a circular saw is not for the faint of heart. Note the dark areas; those are waterlogged. to be well bonded to the bottom skin. This is the waterlogged mess I pulled out. pattern that goes with the length. 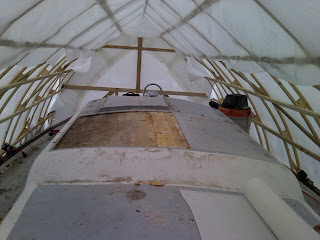 I finish pulling the skin off that section of the cabin top. Talk about horrific. I don't know what happened or how I managed to forget that the holding tank (bladder) had about 3 or 4 gallons of urine and poop in it when I hauled it 3 years ago, but late last week it dawned on me that this was the case. 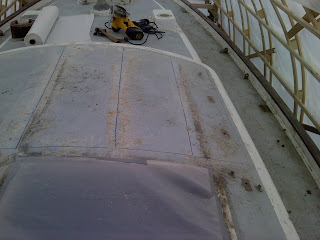 I was planning on my next steps for the recore and was measuring the underside of the foredeck to setup a bracing framework and it hit me... Had I had it pumped before I hauled the boat in 07? Ohhhhh Noooooooo. I opened the hatch underneath the v-berth and sure enough, the bladder was not empty. The good news was that it was not full and it has been so cold that it was frozen. The bad news was that the bladder was frozen flat about 20" wide by 6" high, and the only access to that compartment was about 10" wide by 10" high. I really didn't want to have to cut it out through the top of the v-berth bunk, so I rested my hopes on being able to fold and wiggle the bladder out through the access hatch even though it was frozen. There are 2, 1-1/2" lines into the bladder (1 from the head and 1 to deck pumpout) that I couldn't free up so I cut through them with a hacksaw. When I sawed into the first one I heard a loud 'pfffffffffft'. A second later I was overcome by one of the nastiest smells I have ever been subjected to. Just awful. I can't even imagine what it would have smelled like if I had waited until a warm summer day. Armed with an urgency that can only be found in the desperate, I ripped through the rest of the first one and quickly cut the second one before I backed my head out. I found a pair of rubber gloves in the galley and duct taped them over the cut hose fittings and stepped out for some air and dry heaves. To make matters worse, I was now faced with somehow getting the bladder out of an opening smaller than the bladder. Sadly, I seem to run into the square peg round hole thing more than I care to admit. So I decided to blow some heat into the compartment with my milwaukee heat gun to soften up the stew in the bladder so I could hopefully fold it up and wriggle it out. Probably not the best way to keep the smell down but it did the trick. Being as careful as I could, I folded and tugged the bladder out of the compartment without rupturing it and causing me to abandon this restoration project entirely. Once I got it out of the boat I promptly took it outside the shed, cut the rubber gloves off and turned it upside-down in a snowbank and let nature take its course. That was enough for today. Time for a long shower. Before I tackled the holding tank project I did manage to get the final pieces of woodwork off of the companionway. With the associated madness of the holidays I didn't get too much done over the last month. I spent a few hours over a couple of days removing the hardware from the decks. I think I have everything except a few hatch hinges removed. I spent a fair amount of time labeling and cataloging everything so I know what goes where. I plan on posting pictures of the mess I've made when I am finished removing everything. At that point there won't be much I can do until the spring when temps warm up enough for the epoxy work. I am going to take a week off sometime in April. 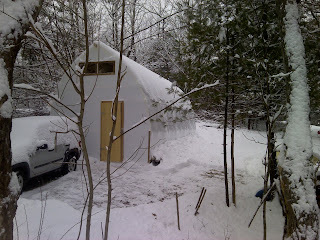 A few notes on the shed. 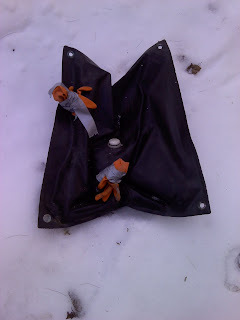 It holds up to snow very well and now that it is starting to pile up, the bottom edges are closed in and the salamander heater heats things up nicely. I was working yesterday and had the temp around 50 degrees in the shed while the outside temp was 25. 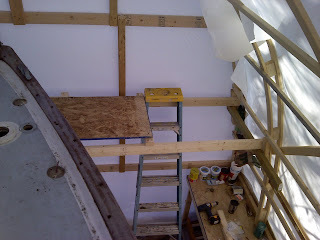 I put up a plastic vapor barrier on the top inside of the shed to keep the moisture down, as the propane heater puts out a lot of moisture. 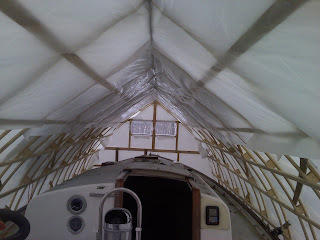 The picture probably can explain it better than I can, but by stapling the plastic up on the inside on the top of the shed, any condensation caused by excess moisture will go to the upper skin and will not fall on the boat as the condensation (when not frozen) will drip on the stapled plastic. Seems to work well so far.